rec. 2018, Waalse Kerk, Amsterdam. Capella Amsterdam lost its government grant in 2018, so it is good to see this excellent ensemble still up and running and in such good voice. In the swings-and-roundabouts lottery of gains and losses, the Harmonia Mundi saw a positive result in becoming the Gramophone ‘label of the year’, also in 2018, and in supporting glorious programmes such as this one they deserve all the awards and plaudits that come their way. An entire CD filled with Funeral Motets and Deplorations might seem a depressing prospect, but Josquin des Prez’s music has an uplifting beauty that carries us along on a carpet of sound – we are transported aloft rather than dropped into a dark, dank hole. Alice Tacaille’s booklet notes point us towards the ‘Grand Rhétoriqueurs’; French court poets of this period whose ornate style was ideal for turning into motets, mournful chansons and other liturgical music by the likes of Josquin. All of the sung texts here are printed in French, Latin, English and German, so it is easy enough to appreciate where words and music join hands to create the most exquisite polyphonic lines and harmonies. The final Musæ Jovis by Nicolas Gombert is an appropriate tribute to Josquin after his death, relating in melody not only to one used by him in a piece earlier in the programme, but also referring to compositional techniques that were a distinctive part of his style. These kinds of cross-references, some audible, some not, are a feature that runs through this programme – Josquin’s tribute in turn to Ockeghem having its own fascinating aspects. Beautifully sung and impeccable recorded, this is a gem of a CD. There are or course numerous places where this repertoire can be found, and many very fine recordings. 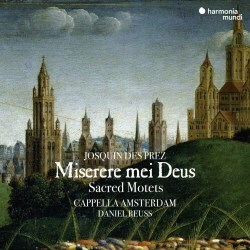 I compared the Miserere mei, Deus with that of Weser-Renaissance Bremen on the CPO label (review), and found myself preferring the more unified vocal colour and contrasts of Capella Amsterdam, the singers of which somehow manage to create an added musical richness which, to my taste at least, wins over the more pious character given to the piece by the Bremen voices. Reduced forces can offer yet another alternative, as with Cappella Pratensis on the Challenge Classics label (review), but even with a slightly lower pitch and strikingly similar tempi to Capella Amsterdam the all-male ensemble is a bit too intense for my ears, and the recording doesn’t have anything like the atmosphere of that in the Waalse Kerk.